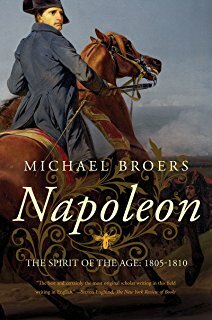 A glance at the title of Michael Broers' new book Napoleon: The Spirit of the Age: 1805-1810 makes clear that what might once have been conceived as a two-volume work is now going to stretch to three at least, since this one closes while Bonaparte still has eleven more years to live. This latest book, The Spirit of the Age (an equally ridiculous notion as the title of the previous volume, Soldier of Destiny – Bonaparte was never in his entire military career a soldier of destiny, and much though he and his sycophants might want it to be true, neither was he the spirit of the age; any Parisian tailor would have had a better claim to the latter), instead becomes a classic middle-of-a-series volume: part bridge, part spotlight, part undifferentiated muddle. The book begins in the winter of 1805 with Bonaparte's impulsive march across the Alps to the Battle of Austerlitz, in which the strength and sheer tenacity of the Grand Armée managed to defeat their combined Russian and Austrian opponents in spite of Bonaparte's own blundering miscalculations throughout the day. The narrative of what Broers non-ironically calls “the Napoleonic epic” reaches its greatest pitch in this volume at the 1807 bloodbath that was the Grand Armée's clash with the Russian army at the Battle of Eylau – with Broers on hand as usual to do damage-control for the pestiferous little Corsican. “Napoleon put on one face to a France where he knew both he and his far-off war were detested,” he writes. “Behind the propaganda, he had no illusions that he had failed to win even a technical victory at Eylau; nor was he unmoved by the slaughter.” It should go without saying that there's no shred of convincing evidence that Bonaparte was moved by the needless slaughter occasioned at Eylau by his own callous battlefield orders, and there's likewise no convincing evidence that he himself didn't believe the propaganda he ordered to be disseminated throughout his captive country. The Spirit of the Age moves on through some of the other well-known landmarks of these five years, from Bonaparte's excommunication by Pope Pius VII to his marriage to Marie-Louise of Austria. But it stops short of the climax all Bonaparte fans know to expect: the dictator's France against Great Britain, the heyday of Nelson and Wellington, the crucible of Waterloo, the two exiles. This volume mainly details five years of Bonaparte's miscellaneous war-making on the Continent. Napoleon, however, was the future. He used the power he wielded and the freedom he had won himself to forge a viable, potent state, adapted to the needs of an advanced society. While Alexander could build an army and alliance, Napoleon created an edifice so powerful that it could shed its maker and march one, alone. Alexander's assiduous biographer, Marie-Pierre Rey, concludes emphatically: 'Alexander no longer belongs to Russian history.' Nothing of the kind could be said of Napoleon, not just in France, but in Europe and the world.